I am in the beautiful city of Seattle this weekend and the sun is shining and it is a breathtakingly beautiful day! Seattle is one of my favorite places to visit. I travel all over the world and I can easily say that it is one of the most beautiful cities in the world. However, as my mother would say. it's not Scotland! For those of you who have been to Scotland, live in Scotland or have an overwhelming call to visit Scotland, you will know what I am talking about. And Scotland does call. I believe it actually has something to do with the earth itself and a strong connection between our physical bodies. I have been all over Ireland, Wales and most of England but I only get this feeling in Scotland. I think Ireland is absolutely beautiful and I love every moment that I am there. If I could not live in Scotland, Wales would be a very close second but still, they don't call to me quite the same way. I can and do spend days traipsing through the Yorkshire Dales, Lake District and the Cotswolds and there are all magical wonderful places that I love dearly but they do not call to me to come home! Why is the feeling so strong and where does it come from? I have pondered it many times but have yet to find a real, logical answer that does not involve emotion. 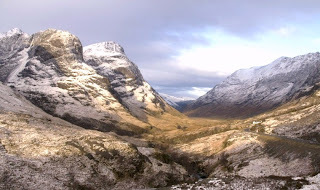 Picture is from Glencoe in winter.